Arthur L.D. Haggerty, 80 died Sunday evening at Highsmith Rainey Care in Fayettevile, NC. 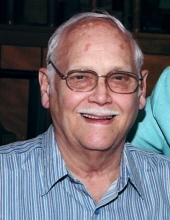 He is survived by his wife of 59 years, Minnie Ezzell Haggerty of the home; his daughters, Kathy Chastain and husband Yancy of Georgia, Donna Paulson and husband Thom of Michigan, Deborah Widrig and husband Louie of Michigan, Karen Smith of Warsaw, and Arlene Kortema of Michigan; nine grandchildren, eight great grandchildren, and one great-great-grandchild. He was preceded in death by his parents; Arthur James and Adella Francis Haggerty; and a brother, Arnold J. Haggerty. A service to remember Arthur will be held on Thursday, August 9, at 11 o’clock in the morning at Johnson’s Baptist Church, Warsaw, with the Rev. Buck Grady officiating. The family will receive friends beginning at 10 o’clock that morning prior to the service. Burial will follow at Devotional Gardens, Warsaw. Arthur was a member of the Johnson's Baptist Church, Order of the Eastern Star #267, Newton Grove, and the James E. Dillon Lodge, #466. He and also served in the U.S. Army. A service of Tyndall Funeral Home, Mount Olive. To send flowers or a remembrance gift to the family of Arthur L.D. Haggerty, please visit our Tribute Store. "Email Address" would like to share the life celebration of Arthur L.D. Haggerty. Click on the "link" to go to share a favorite memory or leave a condolence message for the family.